A pair of adult trumpeter swans. The trumpeter swan, Cygnus buccinator, is the largest North American swan, and is almost entirely migratory. 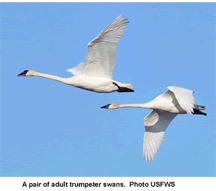 The swans of the Lacreek National Wildlife Refuge spend winters there, and migrate to Greenwater Lake Provincial Park in Porcupine Plain, Saskatchewan. Annual migrations, like all migrations, are expensive strategies for any animal, adopted only when they offer significant advantages. Many professionals today face stark choices similar to the choices the ancestors of migratory animals faced: keep doing what you're doing in the place you're now doing it and risk extinction, or go somewhere else and perhaps do something else that might be better. Migration for professionals can be a relocation, career change or a combination of both. It isn't pleasant, but what's the alternative? Photo courtesy U.S. Fish and Wildlife Service. Finding work in tough times is like marketing in an environment that's flooded with sellers. At the executive end of the job market, compensation is high enough to support professional executive placement specialists, but if you aren't one of the elite, you'll be doing your own marketing. Here are some suggestions for positioning yourself as a superior product, reaching the buyer ahead of your competitors, creating a compelling message, and making yourself easy to find for anyone looking for someone like you. Professional societies emphasize education, networking, and job search services tuned to your profession. You can exchange news and techniques with colleagues. Especially valuable: leadership positions or responsibility for posting job openings. Teaching in continuing education programs dresses your resume; keeps you fresh; and gives you networking opportunities, access to library facilities, and faculty discounts for equipment and software. Tight budgets are compelling chapters of professional societies to favor local non-professional speakers. Extra income is unlikely, but you'll make yourself known to people who might want to hire you. Avoid surprises in interviews by being informed about current events in your profession. And be among the first to learn of new opportunities. If you're targeting a particular company, set a Google alert related to your target. Set alerts for people you know, your target industry, yourself, and anything that appears on your resume or record, or anything anyone might ask you about. Include misspellings. Effective networking requires discipline, organization, and dedication. Networking in person is best; telephone is next best. Networking through Web sites can be helpful, too. There are books and Web sites galore. And job search networking groups are almost everywhere. Search for groups in your area by modifying this example for Boston. As an active electronic networker, with a presence at LinkedIn, Facebook, and Twitter you'll create a multi-media resume. You'll gain a clean, professional presence that highlights your accomplishments, capabilities, and assets. On-line resume databases often display submission dates to employers, who sometimes interpret older dates as indicators of undesirability. Visiting your submitted resumes monthly and making slight modifications probably resets the submission date. Publish books, scholarly articles, book reviews, or articles in trade magazines or Web sites. Regular book reviewers often get free books, and you'll be helping the world find you. If you have useful things to say, create a blog, or tweet regularly. It's a commitment, but it can also keep you sharp and engaged, and the word will get around. For more on finding work in tough times, see "Finding Work in Tough Times: Strategy," Point Lookout for July 8, 2009; "Finding Work in Tough Times: Infrastructure," Point Lookout for July 15, 2009; and "Finding Work in Tough Times: Communications," Point Lookout for July 29, 2009. Would you like to see your comments posted here? rbrenVJDqWRfwbckTKHaGner@ChacehxjGFMhmkzjNEiwoCanyon.comSend me your comments by email, or by Web form. I offer email and telephone coaching at both corporate and individual rates. Contact Rick for details at rbrenqFSjQwKkZuKBrEGvner@ChacFZXFhSZcUSNJtOxnoCanyon.com or (650) 787-6475, or toll-free in the continental US at (866) 378-5470.